We consider every quilting job to be a "custom" project. We discuss your quilt with you and work with you to choose the perfect quilting design and thread colors. for all patterns. Edge to edge is our most popular and most cost effective way to turn your quilt tops into beautiful, useable quilts. To estimate cost for edge to edge quilting, multiply the width of your quilt by length (in inches). The result is your total square inches. Then multiply that number by .025. Batting and thread are additional. Example: You have a quilt top that measures 66" wide and 86" long. 66 x 86 = 5676 square inches. 5676 x $.022 = $124.87. You will need to add cost of batting, thread, and any extra services (such as binding) to estimate your total cost. You can always call us for help - 303-425-4000. If you are interested in having us make a quilt for you (Memory, T-shirt, etc) please Click here to go to our Custom Quilting Section Through our custom quilting service we will make just about any type of quilt to order. This includes memory quilts, T-shirt quilts, art quilts, and completing quilt kits. We offer a full menu of ways to enhance your quilt. This would include individual blocks, borders, echoes, or other quilting styles. In some cases you may want parts of the edge to edge pattern "trimmed" so quilting doesn't go over embroidery or applique. For specialty projects we will consult with you to learn what you want. In some cases we will generate a preview and email it to you so you can see what the quilting will look like. If you like, we can provide you an estimate of the maximum charge for the entire project. Your final cost may end up slightly higher or lower depending on the actual time and materials it used to finish your project. All over edge-to-edge of includes simple meanders, feathers, swirls, heats, butterflies, lots more! Quilting any border, sashing, or frame. Repeating an outline of any object. BINDING SERVICES: We offer several binding services. 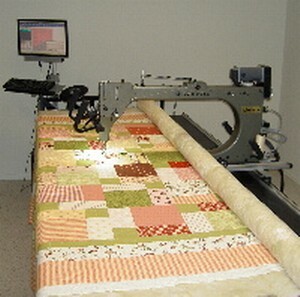 All projects which do not use edge to edge quilting patterns are considered custom longarm quilting. The rates for this vary from $.05 - $.17 per square inch depending on the time and detail required. You can supply your own batting, however it must meet our quality and size requirements for machine quilting. We do not quilt with any battings that contain more than 20% polyester. All customer supplied batting that contains polyester is subject to our approval. Thread: Thread charge is $3.00 per bobbin for one solid color of thread. Variegated threads are available for a slightly higher cost. Our minimum quilting fee is $49 for quilting service only. Thread, Batting and other services are additional. 36" x 60" 27" x 52"
Twin Size 69" x 90" 39" x 75"
Full Size 84" x 90" 54" x 75"
Queen Size 90" x 95" 60" x 80"
King Size 106" x 98" 76" x 80"